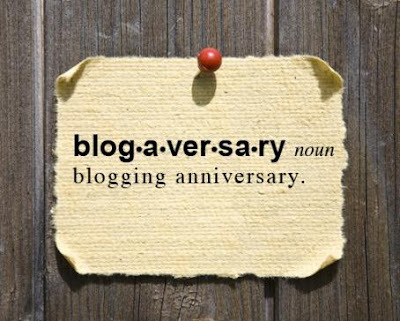 I've been absent the past week or so... but I will nonetheless now celebrate my 2nd Blog Anniversary (Oct. 29th)! Woohoo! The flowers and cards have been pouring in from all my adoring fans. Thank you thank you... but really, its too much. My blog has gone through many facelifts in its two short years of existence. I wish I had a picture of the simpler times... before there were sites just for blog backgrounds and html changes...but check out some early posts HERE. 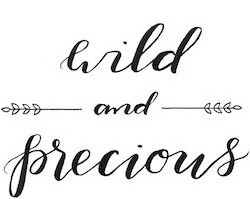 A special thanks to E.H.R for first inspiring me to start my blog. Oh the times, they are a changing! Thank you for the past two years. You have supported me through many a tough times -- a most unpleasant job last year, my eggnog taste-testing phase, all the times I got tagged, and when Pandora broke my heart. You've always been there to share in my joys and brag about my craft and cooking accomplishments. You revel in Nashville with me. You are indeed my friend. Happy 2nd Birthday/Anniversary - whichever you prefer, just know... you are loved! 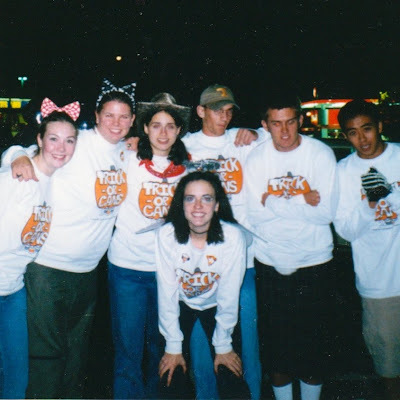 To close this post I will now add a few pictures from my HS Junior year Halloween. 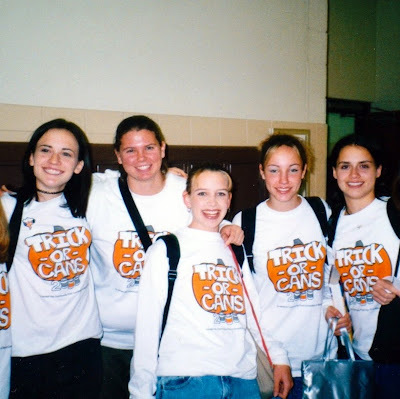 Let me preface by saying that my freshman year in HS my sister and I started Trick-or-Cans. The first year twin & I + 10 of our friends went door-to-door collecting cans instead of candy. We pushed around borrowed shopping carts and filled the parlor floor with cans. 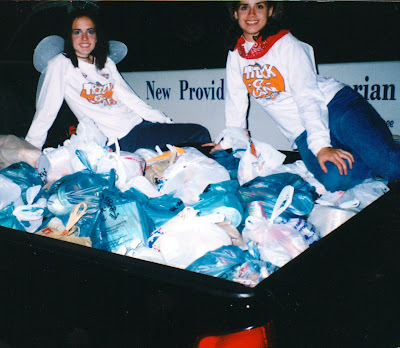 By my Senior year we had expanded to include all the county high schools and several local churches -- I don't even remember how many trick-or-canners were going around, but we consistently collected THOUSANDS of lbs. for the local food kitchen. Trick-or-Cans is still going on today. Check out an article HERE. Okay, I think this forever-long-post makes up for my recent absence. David and I are having a Halloween Bash tonight... stay tuned for pictures!